Over the holidays I had a chance to read Trevor’s new book “Augmented Reality using Appcelerator Titanium Starter“. Although I was a technical reviewer this was my first chance to read the completed book cover to cover. Augmented Reality. 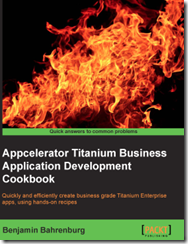 If you are just getting started with Titanium this book has a ton of recipes to help get you started. My favorite section was the discussion on how to handle the views which draw the different location elements. This is a fresh approach on handling performance issues often related to rapidly moving views. Just as interesting was the discussions related to the different location algorithms. Even experienced Titanium developers will find new useful snippets to take away from the author’s code. If you are new to Titanium development you might want to check out Appcelerator’s Getting Started Guides first, as the author focuses his time on discussing the complexities of the augmentedTi app instead of setup topics.